The Economic and Financial Crimes Commission (EFCC) has frozen 30 accounts and seized 37 assets allegedly belonging to the former Chairman of the Nigerian Social Insurance Trust Fund, Dr. Ngozi Olojeme. The agency had earlier linked 38 houses to Olojeme but it has obtained a court order to seize 37. In one of the houses at No. 25, Kainji Crescent, Off Lake Chad Crescent, Maitama , Abuja, the EFCC detectives were said to have uncovered a state of the art bathroom suspected to have cost about $2m to $4million. The EFCC is probing about N62.3billion fraud in NSITF with $48,485,127 credited to Olojeme. 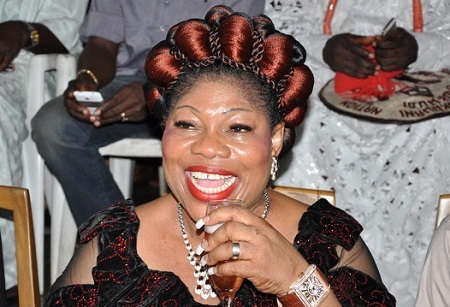 But the EFCC, however, yesterday said Olojeme was yet to admit that she committed any fraud while in office. She insisted that she was innocent of all the allegations against her in spite of the fact that her Account Officer, Chuka Eze has spilled the bean. Findings by our correspondent revealed that the probe of Olojeme has reached a level for her arraignment in court by the anti-graft agency. A top source, who spoke in confidence during an update session yesterday, said: “We have frozen 30 accounts traced to Olojeme in some banks. But our detectives discovered that she is the kind of person who does not keep huge money in these accounts. In some of these accounts, there were funds ranging from N20million to N30million, which were insignificant compared to slush funds traced to her. “Investigation confirmed that the cash looted in NSITF was evacuated under the guise of award of contracts. The contract sum will be paid to a company and her Account Officer will pick the raw cash and go to Bureaus De Change(BDCs). “The Account Officer, who has made startling revelations was actually what our detectives termed ‘clearing and forwarding’ for her. “When we confronted her with our findings, she refused to admit committing any infractions while in office. She refused to admit having been confident that all the slush funds were withdrawn in cash. “So far, she is ready to go through the rigours of trial. We are already seeking legal advice on whether or not she should be arraigned with other management staff of NSITF or be tried separately. “Already, the EFCC has arraigned a former Managing Director of Nigeria Social Insurance Trust Fund (NSITF), Umar Munir Abubakar and four others for alleged diversion of N18billion out of the sum in question. Responding to a question, the source added: “We discovered a state of the art bathroom in one of her houses at No. 25, Kainji Crescent, Off Lake Chad Crescent, Maitama , Abuja. The EFCC is suspecting that the bathroom might have cost about $2m to $4million. Meanwhile the EFCC has secured a court order to seize 37 out of 38 houses allegedly traced to Olojeme. The seizure followed an Interim Forfeiture Order by Justice A. I. Chikere of the Federal High Court, Abuja. The order said in part: “An order of interim attachment/forfeiture of the asset attachment of the properties set out in the schedule attached herein. “An Order authorizing the Economic and Financial Crimes Commission to appoint competent persons/firm to manage the assets/properties listed in the schedule herein, temporarily forfeited to the Federal Government pending the conclusion of investigation and determination of criminal charges against the suspects. “And for such further or other orders as this honourable court may deem fit in the circumstances of this cases. The report said in part: “That through this process, Dr. Ngozi Olojeme, the then NSITF board chairman, has collected a total sum of $48,485,127 from Mr. Chuka Eze (her account officer at FBN), which cash he collected on her behalf being the dollar equivalent of monies paid to BDCs by NSITF contractors. “For instance Abubakar and others dishonestly converted to N18billion, being contribution from the Federal Government of Nigeria as take-off grants and Employees Compensation Scheme (ECS) for MDAs.